Anyway, to commemorate this first official day of spring -- at least, so the calendar says -- I would like to present some cheery flowers to you! Here's a little story. A few weeks ago, when I was opening a new bag of oranges (yum! ), I took notice of the cool netting bag they came in. A light bulb went on! THIS IS AN ART SUPPLY! I decided then and there to use the netting as a stencil. I could hardly wait to get started. For my March Stamp-In, I wanted to have my attendees be able to create an Easter card. However, I do not possess any of the current "Easter" sets. When the current big catalog was released, I immediately fell in love with the Summer Silhouettes stamp set (page 82). I purchased it and proceeded to "file" it on my shelf. While perusing my sets to see what I could potentially use for an Easter-y look, my eyes alit on this set! Perfection! I started out with a simple piece of Whisper White card stock, and gently sponged through the netting with Daffodil Delight, Melon Mambo and Tempting Turquoise. I started out soft, and added to the color here and there until I was happy with my Easter egg-y looking background. I started to make a floral display over the stenciled area, not being too concerned if any of the netting images showed through my flowers. When I finished, I was still not satisfied. It was entirely too "flat". Hmmm. Should I? Why not. 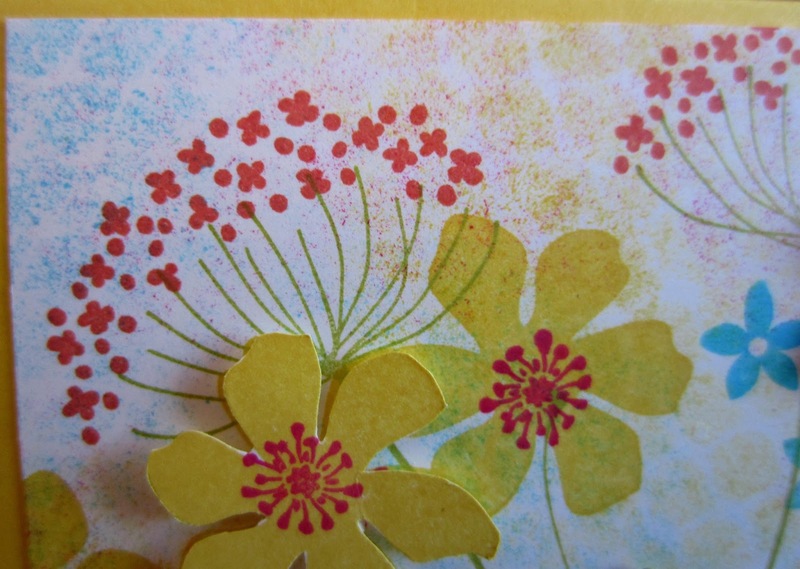 So I stamped two of the large yellow flowers on a scrap of Whisper White, then carefully went to fussy cutting. When my flowers were cut out, I popped them up over existing stamped flowers of the same variety. Aha! Dimension! OK. I had this pretty springy looking background. Now what?? I kept adding various elements, but was still never satisfied. MORE dimension!! 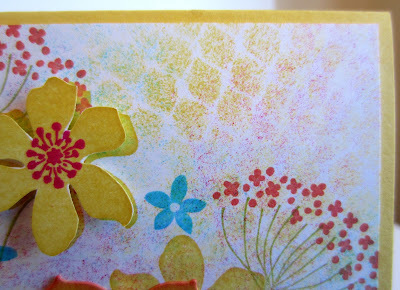 I grabbed the Blossom Party Originals die (page 193) and ran it through my Big Shot with Daffodil Delight card stock. I put my flower together without gluing it. And . . . blah. Get that thinking cap out again! Good thing I never put anything away -- it was still handy. Well, I sponged my stenciled background, right? Why not a little more sponging? I used Melon Mambo on the edges of each of the layers of the flower. After I glued it together and lifted the petals a bit, it look great. I added a button from the Brights Designer Buttons (page 176), with a bit of the White Baker's Twine knotted through it. It STILL didn't do it for me. I grabbed by trusty Little Leaves Sizzlit (page 191) and Lucky Limeade card stock, and tucked the adorable little leaf stem behind my flower, and I was a happy camper! I showed the card to a friend, and as she took it from me, she held it VERTICALLY! And, I had to admit that, even though I had intended for it to be a horizontal card, I sort of fell in love with it in the vertical position also! What a dilemma. Hmmm. Now what? I always stamp my name on the back of the cards I create. The moment of truth: Should I make it a horizontal or a vertical card??? I opted for my original horizontal layout. But . . . I would like to know YOUR opinion. Which version do you prefer? Fold a 5 1/2" x 8 1/2" piece of Daffodil Delight card stock in half, creasing it well with a bone folder. Cut out three pieces of the netting from the oranges bag. Placing first one piece of netting randomly onto a 4" x 5 1/4" piece of Whisper White card stock, lightly sponge Daffodil Delight ink through it. Move the netting to various spots, and repeat with the Daffodil Delight ink. Then, using the second piece of netting, repeat this process with Melon Mambo, then with the third piece, use Tempting Turquoise. If you are not satisfied with the look at this point, add a bit more here and there. My white card stock was almost completely filled with stenciled color, but very LIGHT. Now, make a floral arrangement over the stenciled areas, concentrating more on the upper portion since the bottom part will be covered by the decorative strip. On scraps of Whisper White, stamp two of the larger flowers with their centers. 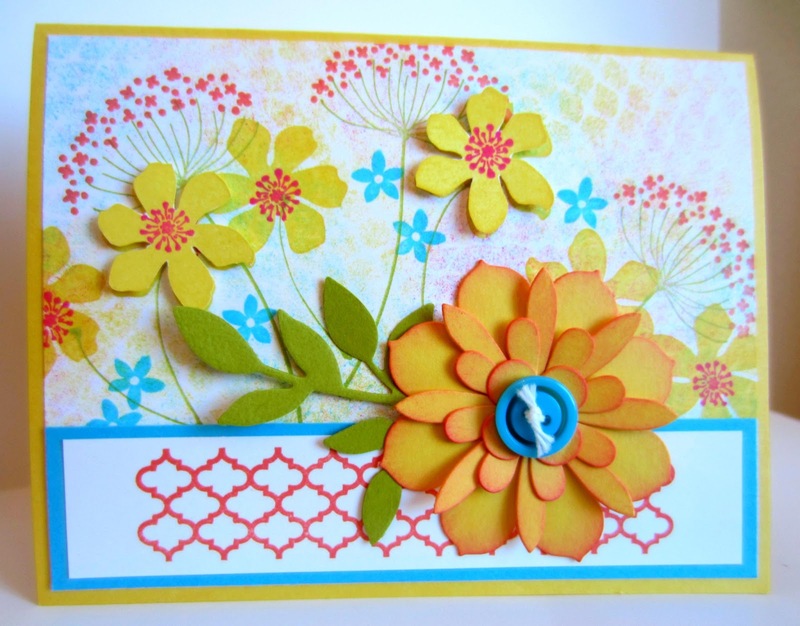 Carefully cut them out, and apply them over their stamped counterparts with pieces of Stampin' Dimensionals. Stamp the decorative trim in Calypso Coral on a 1" x 5" strip of Whisper White. Adhere this strip to a 1 1/4" x 5 1/4" piece of Tempting Turquoise card stock, then to the flowered piece, lining up the side edges and the bottom edge. 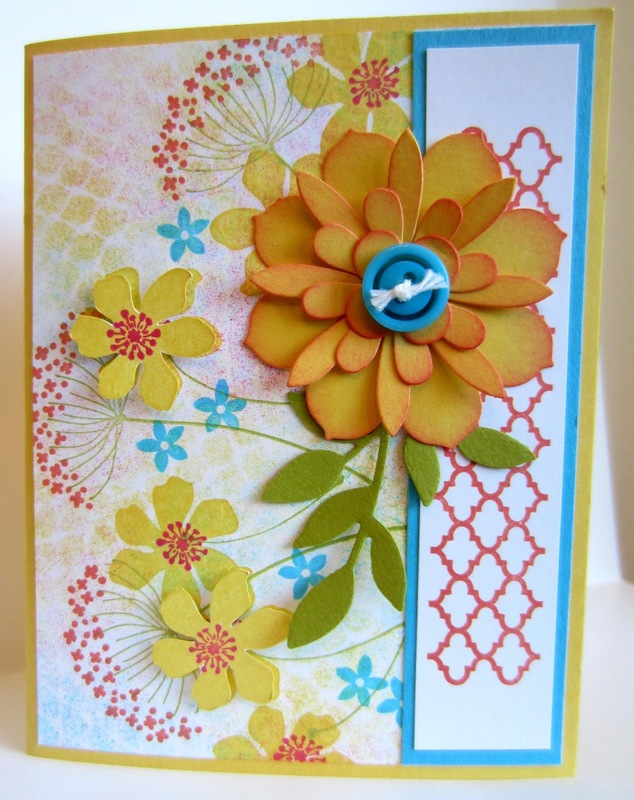 Adhere flowered piece to card front. 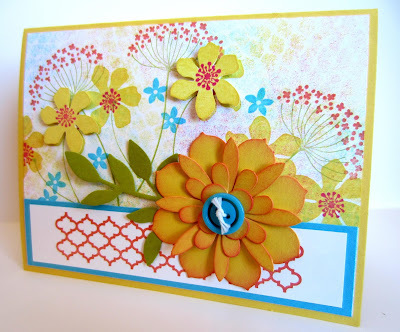 With the Big Shot, cut all the flower pieces from Daffodil Delight using the Blossom Party Originals Die. Sponge all the edges of the flower pieces with Melon Mambo ink. Adhere the pieces together to make a flower. Tie a piece of Whisper White Baker's Twine through the holes of the button and adhere to the center of the flower with a Glue Dot. Use the Little Leaves Sizzlits in the Big Shot with Lucky Limeade card stock to create a leaf stem. Attach the leaves to the back of the flower, and then adhere the flower to the card front. I intended this to be an Easter card, but it could be used for any occasion. Add sentiment of choice inside card. Beautiful card and very creative! Love the netting idea. Also, I agree that vertically is the way to go! Saw your post over @ Someday Crafts today! Oh how pretty this card is!! I really love the bright colors! Well...I guess I am going to be different here and say that I really like it best horizontal...but either way it's absolutely beautiful! So happy to have found your project and your blog through the FPTFY "Whatever You Want" Linky Party! I have pinned this awesome card and am now a happy follower! Love how your card progressed into a gorgeous card, beautiful! Your card is pretty any way you hold it. I like how you used the netting as a stencil. What a great idea. Here I was, typing away on the comment section for this post, and my ipad blanked out!! I had to wait until I could get to the BIG MAMA computer to re comment!! OK...I was saying, the background colors with the flowers and base papers are just wonderful!!! I love the flowers and how you made them pop both with the popdots and the color shading around the petals. The green sprig really pulled it together because I think it emphasized the larger flower and made the eyes go to it first. Totally awesome design and a card that I WOULD HAVE TAKEN TOO!!!! I think because of the stamped flowers in the background having a certain growing pattern upward that the card kinda belongs horizontal, but the way it looks when held vertical is lovely too!!! SO....who knows. I like them both! Great card projects this week!!! And I'm glad you shared them with us for the party! I'm new here, stopping by from the Freedom Friday's blog hop - what a gorgeous card! I love paper crafts but this is extreme paper crafting, I think! Happy Friday! This is a gorgeous card either way. It's amazing. I love your card. The design, the colors, the ease. Thanks for sharing over at Craft Junkie Too. Cute Card. Thanks so much for sharing with Wednesday's Adorned From Above Blog Hop. Have a great week. I have been saving netting for awhile now and forgot I had it. Making a thank you card right now and headed for the netting. Great job Linda. Your cards are always so bright and pretty! This one really does look like spring. I love it! Thank you for linking up to the In and Out of the Kitchen Link party! I can't wait to see what you bring next week! Very creative of you to see the potential in a piece of netting, Linda! It turned out lovely :-) Thank you for sharing at our ALL MY BLOGGY FRIENDS Link Party ! 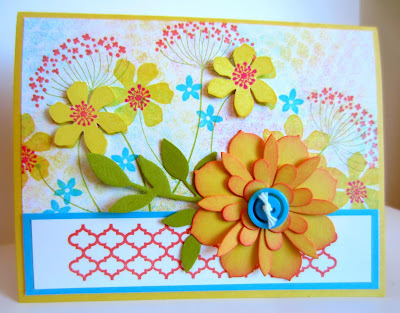 Your card has been featured on The Creative HomeAcre Hop! Love it! Thanks for sharing! Such a pretty card. All of your cards are delightful but I chose to feature you and this one on BeColorful this week. Thanks for sharing. So lovely!! Thanks for sharing at Romance on a dime! !